In updating my photo software, all of the photos of this trip were somehow deleted. Some photos below are mine, copied from the previous blog entry. All other photos were taken by Scott Locorini, unless specifically identified as otherwise. Getting There: March 3 – 6, 2009: I decided to drive to Florida this time. There were several reasons for this. My buddy, John Resch is from Rochester. I needed to go to Rochester to visit my son who was scheduled for surgery in a few days. John was already in Florida playing golf (a nasty habit!). Since I needed to make the trip to Rochester anyway, I offered to pick up his boat and gear, and haul it to Florida along with my stuff. This would also be the first long road trip with my new car. Usually we don’t need our boats. Scott has boats that are typically part of the package when we sign on for a guided trip with him. We could have used his boats this time too. This however, was a different kind of trip. 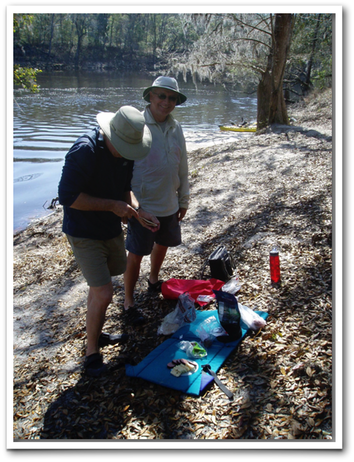 It was an exploratory trip in which Scott would assess the commercial possibilities of the Suwannee River as a site for guided trips. Scott did the planning and we agreed to split all trip costs three ways. John and I were along as (a) companions, (b) guinea pigs, or (c) charity cases; maybe all of the above! But we were very glad to be included. 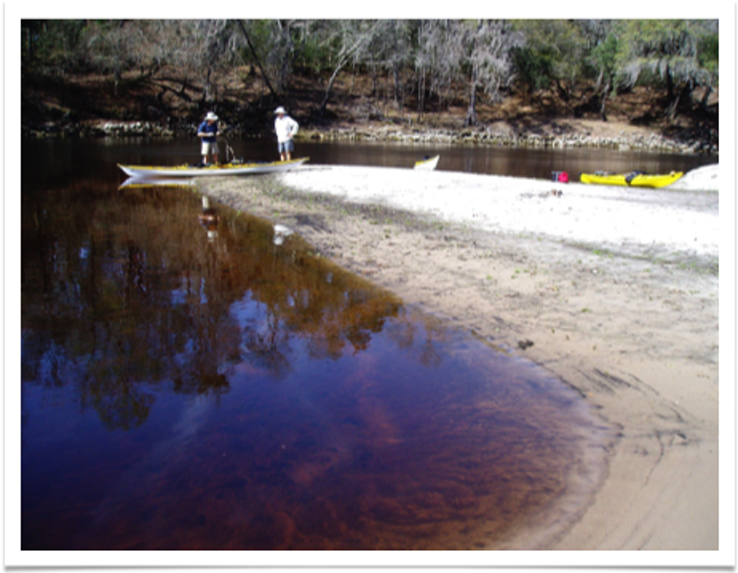 So we decided to haul our boats to the Suwannee just because we wanted to paddle our own boats in Florida. I was on the road early on March 4th after dropping two of my grand daughters at their Junior/Senior High School. I drove all day (I like to drive) and pulled into a Holiday Inn Express in Huntersville, North Carolina around 8 pm. After dinner and a good night’s sleep, I was on the road again by 8 am. A large cup of McDonald’s gourmet blend coffee rested in my cup holder, sending out wonderful wake-up aromas. I was making great time. 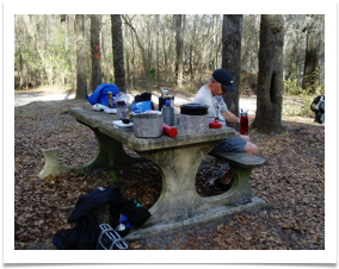 I didn’t need to be at the Suwannee River Valley Campground until early afternoon on March 6th, and it was only March 5th. This gave me some time to look at a few places that Lisa and I could consider if we decide to relocate to the south in the next few years. My first stop was to be St Mary’s Georgia. St. Mary’s is just north of the Georgia-Florida border, about an hour’s drive from Jacksonville. I got to St. Mary’s about two o’clock and walked around for close to two hours. I checked out the paddling possibilities at the Cumberland Island National Sea Shore (marginal) and stopped by Up-The-Creek Outfitters to say hello. Up-the-Creek is listed on my links page and I wanted to see the operation for myself. I then drove on to Jacksonville, a big city. Making my way to the barrier islands, I followed them south through Jacksonville Beach and Punta Gorda, finally arriving in St. Augustine. I liked St. Augustine. So I grabbed a room at a Days Inn in town and went exploring. After breakfast next morning I explored some more and bought some gifts for the folks back home. Then I got back on the road, heading north, this time toward Jacksonville where I would turn left for the rural heartland of Florida. The land here was flat, as is all of Florida, but pretty, and sparsely populated. 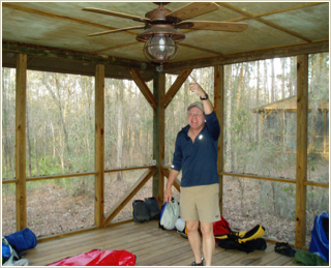 I arrived at the Suwannee Valley Campground, a private KOA facility, at 1:30 pm to find John sitting on the porch of the main building, waiting. John and I exchanged greetings while he checked to see that his boat had made the trip without mishap. We decided to register and start setting up camp while we waited for Scott, as we still had much to accomplish before dark. The registrar was very helpful. 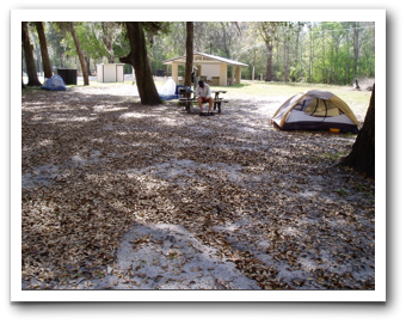 We were happy to find that there were “tent sites” in this campground that largely catered to large RV’s. Directions said, drive into the campground, take a left at the chapel and drive down the road to the tent camping area. John and I headed off in my car but found no chapel or road. On our second swing through the camp, we saw that the chapel was across the road from the main building (we hadn’t started looking for it soon enough) and the road was a barely discernable pathway down a rutted and bumpy hill. 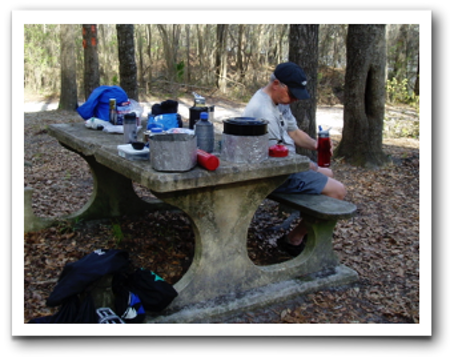 After bouncing our way to the bottom, we pulled up next to a pair of picnic tables under big Live Oak trees. This would be our home for the next twenty-four hours. We were starting to unload our gear when we spotted Scott’s big green van bouncing down the same rutted road we had traveled. After an exchange of greetings, we each picked a spot and set up our tents for the night, and began sorting gear for tomorrow’s launch. It was a pleasant afternoon with time to relax a bit and talk. Around 5 pm, we climbed into John’s car and headed for Live Oak, a nearby town with a Super Wal-Mart and (we hoped) a choice of places to eat. The Wal-Mart was our first stop as we had agreed to shop for food when we arrived rather than bring stuff from home. Scott and I had discussed some meal possibilities before hand and we were soon locating the things needed to prepare several of our favorites. We also created two new meals on the spot from items we found there. 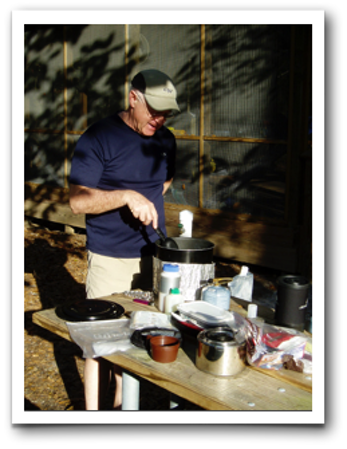 Neither Scott nor I use the prepackaged, freeze-dried camp food that is widely available. We prefer to prepare our own meals from things available in most supermarkets. This is a bit of a challenge as it is very difficult to bring fresh fruits and vegetables on a days-long self-contained kayak trip. Restaurant possibilities in Live Oak were limited. There was a McDonalds, a Taco Bell and some other fast food places. The only place that began to offer a sit-down meal was a Chinese Buffet. We had a better than expected meal at the buffet and, as is usual with buffets, we all ate too much. Back at camp, we set about repackaging our food. We save lots of space by removing things from their boxed packages and placing them in ziplock bags. These are then placed in dry bags by meal type – breakfast, lunch and dinner. By the time we finished, it was dark. The crickets were singing and a beautiful full moon in a cloudless sky shown through the leafless trees waiting for spring to nudge them into bloom. After absorbing this beautiful evening for a time, it was off to bed for what we expected would be a cold night. It was a cold night, with temperatures dipping into the forty’s. I had dressed for the cold, with long underwear, a light polartec sweater and a stocking cap, but still, by 3 am the cold had penetrated my sleeping bag and I was awake. Or half awake anyway. I knew that I had other things I could pull on if I was cold, but I wasn’t that cold, not so cold as to want to unzip my sleeping bag and climb out into the cold night to rummage through a dry bag for ice cold clothing. So I lay there, rolling from my left side to my back and then to my right side, attempting to warm whichever part seemed coldest at the time. By 6:45 am I’d had enough. It was barely dawn, but I got up anyway and began packing up the gear in my tent. By 7:30, everyone was up. Soon the tents were down and we walked to the river to explore the put-in. It was not a pretty picture. We needed to drop our boats atop a high riverbank and hand carry them down a crude switchback trail to the water. The sand beach below was fairly steep to the water’s edge. 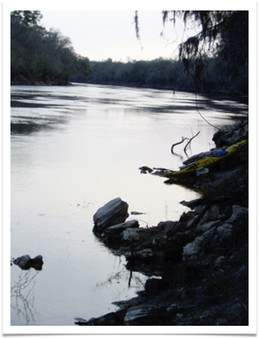 Returning to our cars, we decided to drop our boats and gear on the riverbank near the switchback trail, leaving them while we drove all three cars to Fanning Springs State Park, our end point and pullout. We would leave two cars there and come back in John’s car, which would be left at the KOA while we were on the river. It was a ninety-minute trip each way to drop off the cars. But first, McDonald’s for an Egg McMuffin and a large coffee! The trip to Fanning Springs was uneventful. No one was at the gatehouse when we arrived. It was unclear where we should park our cars or how much the parking fees would be. While exploring, I ran into the assistant park manager. He was off duty, but was very helpful, providing the correct materials for parking and showing us the canoe launch (which we had missed) and an appropriate parking area for our cars. 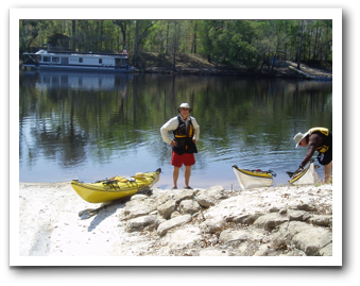 Back at the Suwannee Valley KOA, we carried our boats and then our gear from the high riverbank to the beach below. It was treacherous, as the pathway was layered with fallen Live Oak leaves, which are slick as ice. John and I set our boats on the beach parallel to the river. Scott set his boat perpendicular to the river. The reason for the difference soon became apparent. Kneeling on the uphill side to load our boats was clearly a disadvantage for John and I. As we worked, our boats kept slipping sideways in the sand until they were half in the water. Scott on the other hand, could get to both sides of his boat and could work from downhill, a definite advantage. Experience does make a difference! We launched just before 2 p.m. The river here is narrow with very porous limestone banks on both sides except where the river turns, and it turns often. There the limestone rises high on the outside of each turn, while beautiful sparkling white sandbars mark the insides. 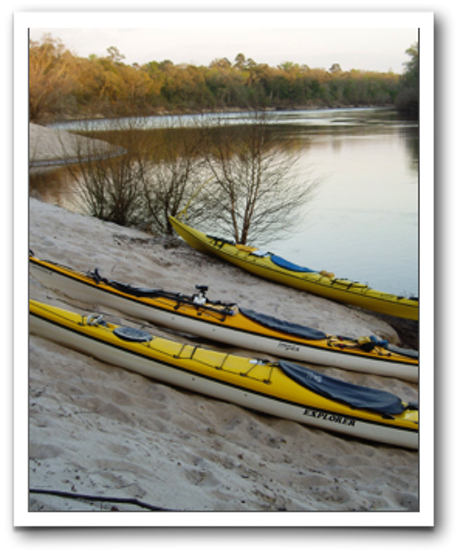 Many paddlers camp on these sandbars north of this section of the river, as they are numerous and are public land. And designated camping areas are few and far between. With so many twists and turns the river is quite beautiful and full of surprises. We were greeted by the Camp Host and told that there was one paddler here using the handicapped unit, with a group of college students, scheduled to arrive any time, needing two units. She suggested we take the farthest unit because of its view and remoteness. We liked the unit and began to settle in as the students and their advisor from Valdosta State University in Georgia arrived. The students appeared to be pretty new at paddling and camping. Their advisor was in charge of the school’s outdoor education program. His goal was to introduce as many students as possible to many different outdoor activities. The students seemed tired but game. 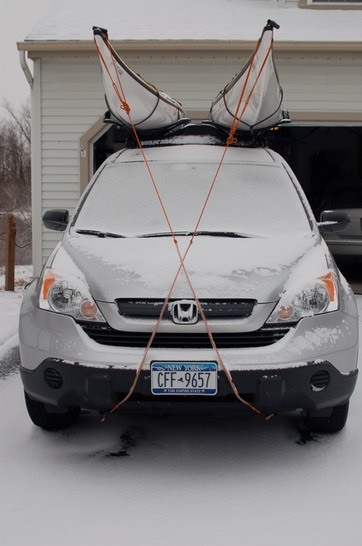 They had paddled the same eleven miles we had, but in much heavier and slower plastic canoes. Soon after arrival they set about making their dinner, but needed to borrow a match to get their stove going. The other camper at Woods Ferry was a single woman named Linda Vanaman. 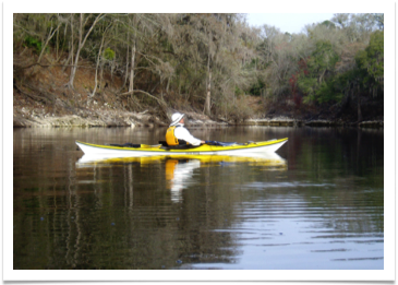 She had paddled a short solo canoe from Fargo , about seventy-miles up stream in Georgia. Her only companion was her dog. Linda had averaged ten or twelve miles per day, camping on sandbars until this night. She was really relishing the luxury of the warm shower at this camp and the ability to wash her hair! 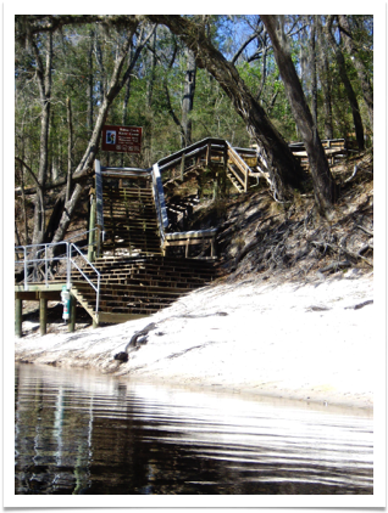 Linda would end her trip tomorrow at the Spirit of the Suwannee Music Park a few miles downstream. I was impressed that Linda had done this trip solo. This was the only time we shared a river camp with other paddlers. Around five o’clock we made dinner. Dark would come early tonight, but tomorrow morning marked the beginning of Eastern Daylight Savings Time. Tonight we would “spring ahead”, pushing sunset back for the rest of the trip, but also delaying sunrise till after 7 am. John, who hadn’t paddled in months, was pooped. He crawled into his sleeping bag as dusk settled around us. Soon the quiet sound of his snoring signaled that he was asleep. Scott and I stayed up quietly arranging gear, getting things in order for the rest of the trip. We left the overhead light on for a while; it seemed like such a luxury. 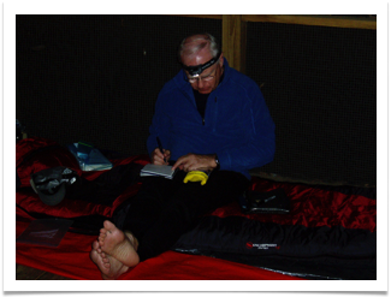 By the time I got back from brushing my teeth, the overhead light was out and Scott was settled in his sleeping bag reading a book about Napoleon with the light from his headlamp. I found my headlamp, put a few things away, then crawled into my bag to read my book, an odd choice called Stiff: The Curious Lives of Human Cadavers (Click here to view book review). The college students were unexpectedly quiet. Apparently they too were tired and ready to turn in. As I lay there quietly reading, I felt a cool breeze on my face. Night sounds began to fill the space around our platform. The full moon rose in a clear sky to shine through the trees again. It would be another cold night. Soon my eyes were heavy. I turned off my headlamp and went to sleep. It was cold again last night. Not as cold as the night before, but cold enough. And since I didn’t have my tent to trap any body heat, I was rolling around again by three o’clock, trying to stay warm. The night started off pleasant enough. But about by early morning it started to cool down. By five, it was cold. Only the tip of my nose stuck out of my sleeping bag, and it was like ice. Northern Florida in early March is still cold on many nights. Dawn arrived late, sometime after 7 am. I dragged myself out in the half-light and pulled on several layers of clothing to fight the chill till the sun came up. Then I set to work making coffee. Scott was grinding coffee beans in a small hand grinder. I’m not enough of a purest to want to go to that trouble, so I fired up the Jetboil and used my pre-ground coffee to brew a cup for both John and myself. We were all moving slowly. 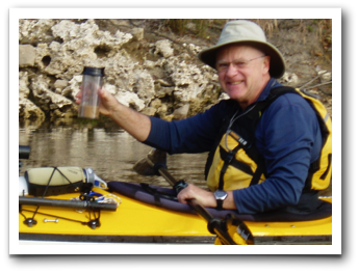 I don’t know if it was the changeover to DST, fatigue from the past two days activities, or just that it was Sunday morning, but we took our time with coffee and breakfast, and continued to move slowly as we packed up our gear, trucked it to the beach and loaded our boats. Loading was somewhat difficult as there were many canoes and kayaks crowded up against a wet and slippery embankment, under the ramp that led up to the campground. I was constantly avoiding slips that would set me down on the wet ground, while carrying bags of gear and excusing myself as I stepped over canoes and around canoeists who were also loading their boats. It was 10:30 before we were in out boats and on our way. The river was especially beautiful this morning. The sun was throwing light diamonds across our path. They gleamed and danced before us as we paddled south. On every side were eroded limestone formations with the roots of Cypress and Live Oak trees making fantastic patterns on the face of the rocks as they struggled to stay upright and hold on. Sandbars were bigger and more numerous along this stretch of river. Their sand is white, very white, and very fine in texture. They gleam on the inside corner of almost every significant turn of the river. As it was Sunday, many families were enjoying the day fishing, swimming and picnicking on them. We saw a few animals today, mostly birds. There were the stubby winged Kingfishers, a hawk or two, Blue Heron, the ever present Turkey Vultures and Black Buzzards, fish jumping everywhere, including what Scott identified as a Sturgeon, and about a gazillion turtles of all sizes. Every tree that had come to rest in the water had several turtles on it soaking up the warmth, with their legs and neck sticking straight out for maximum sun exposure. We arrived at Holton Creek River Camp sometime after 4 PM. 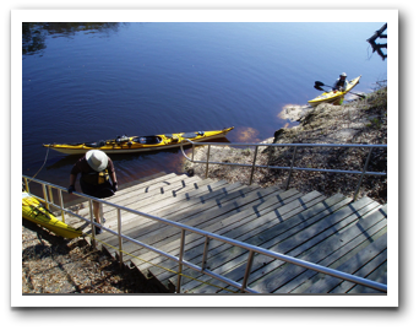 (Click here for a tour of Holton Creek River Camp) The landing here was much better than at Woods Ferry. There was a beach. It was somewhat narrow and inclined, but still serviceable. This camp is similar to the one at Woods Ferry. We went looking for the Camp Host, but instead found a reserved sign on one of the platforms with our names on it. The host was nowhere to be found, and in fact, never appeared while we were there. We were the only paddlers in camp. Camp was soon set up and dinner was underway. After dinner, we all wanted showers, so one by one we headed over to the bathhouse to clean up. I was last, finishing after dark and wishing I had taken my headlamp with me. Returning to our camping platform, I heard John’s quiet snoring and saw Scott deep into his book on Napoleon again. Finding my headlamp, I sat at one of the two benches on the platform and made entries in my journal. Suddenly, I became aware of the silence. It was so quiet; a quiet you never experience at home. There was only the soft call of crickets and John’s muted snoring, with the occasional sound of a page being turned, while the full moon shone through the nearly bare branches of the early spring trees. 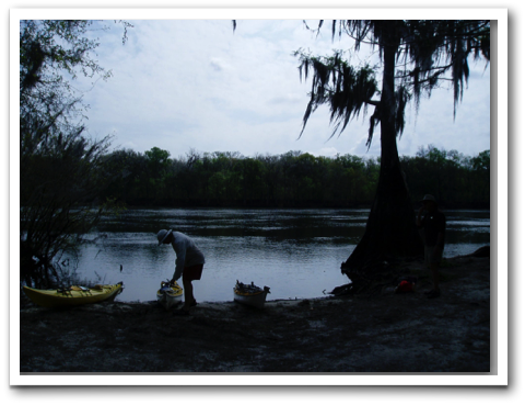 It was a short paddle to our next scheduled camp, Suwannee River State Park. We had fussed about this short paddle because of the several long days that followed it. 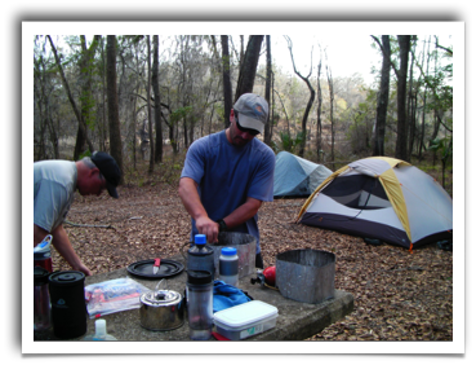 We knew that there were no designated camping areas on the map at twenty miles or so from Holton Creek. 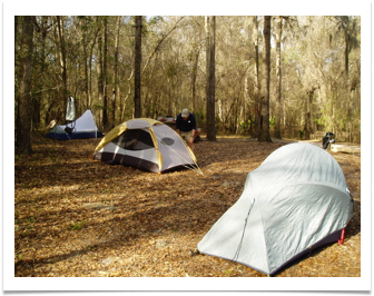 Suwannee River State Park was it until Lafayette Blue Springs River Camp, about thirty miles from Holton Creek. 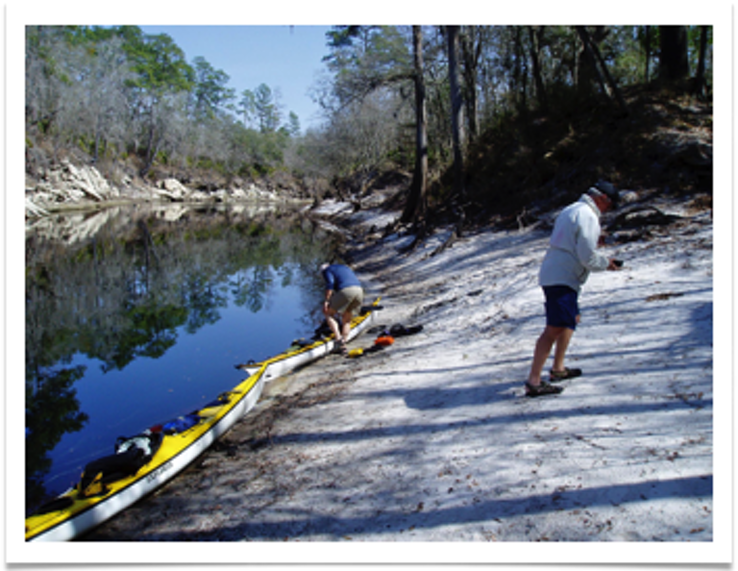 Never-the-less, we decided to by-pass Suwannee River State Park and take a chance on finding a good sandbar or other suitable location to camp on when we had paddled about twenty miles. The river appeared much the same as on the previous days. 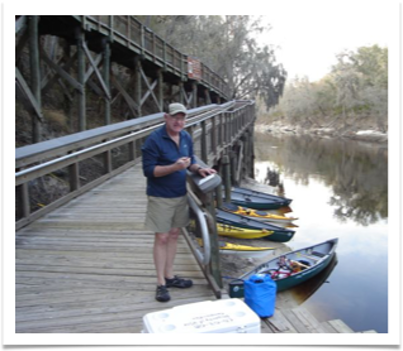 We arrived at Suwannee River State Park about 1:30, took a look at the landing and paddled on. The river began to change below the state park. It became wider with fewer twists and turns. As a result, there were fewer and fewer large sandbars. We passed through a section with many more private river camps. These were camps in the old sense of the word. They were small, rustic getaways, not second homes or McMansions. Scott and I cooked tortellini tonight. I was really good. John cleaned up, then we all sat around and talked quietly as the sun went down and dusk settled around us. A Barred Owl gave a loud and startling cry very close by, which seemed to signal the mosquitoes to come out. These mosquitoes are different than northern mosquitoes. They are black and about a third the size. I seldom felt a bite, and they didn’t itch much at first. But the bites persisted for weeks, some of them becoming quite itchy. Even though it was not yet dark, we went to our tents to escape the little buggers. 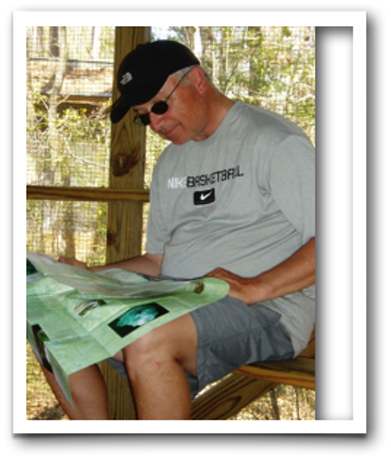 I wasn’t tired, so I sat in my Crazy Creek chair, made notes in my journal about the day and read from my book. Tonight’s chapter is entitled “Dead Man Driving: Human Crash Test Dummies and the Ghastly, Necessary Science of Impact Tolerance”. Why am I reading this book?! It was a long night. As I’ve already said, we were driven into our tents at dusk by little black mosquitoes with a nasty bite! So I sat in my tent reading about cadavers as crash test dummies till my eyes began to sag. I turned off my headlamp and stretched out on top of my Big Agnes bag and pad. It was a warm night. So I decided to leave the vestibule flaps rolled back. It was such a treat to be here like this, sort of stealing a preview of summer and the months to come. I drifted off with the full moon lighting the inside of the tent, through the open vestibule. The howling of coyotes woke me around one o’clock. They were way off somewhere. The moon had moved a great distance in the night sky. I felt a light breeze stir and drift through the tent. It was getting a little cooler, so I climbed into my sleeping bag and drifted off once more, to a lullaby sung by a far off, wild chorus. I awoke again around five o’clock, this time because the temperature had dropped significantly, and I was cold. I pulled on my watch cap and a light polartec sweater, snuggled down in my bag and tried to go back to sleep for a third time. I wasn’t really sleepy anymore. After all, I’d already been in my sleeping bag for eight hours. Still, it was dark and cold, so I stayed put. A Barred Owl let loose with a blood curdling scream somewhere close by. I’m glad I knew what it was. Still, in the dark and cold of the early hours of the morning, it made the hair stand up on the back of my neck! At seven, it was still dark. 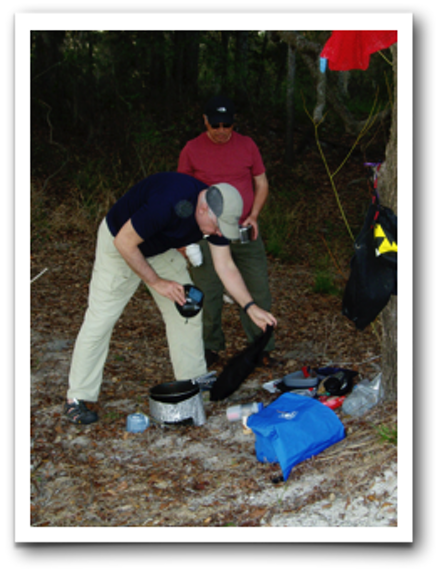 I got up anyway, dressed, and began to pack up the gear inside my tent. A half-hour later it was light enough to crawl out to see what the day might bring. Scott and John had begun to stir as well. We knocked down the tents and munched bananas and granola bars for a quick breakfast. We were on the water sometime after 8:30 am. 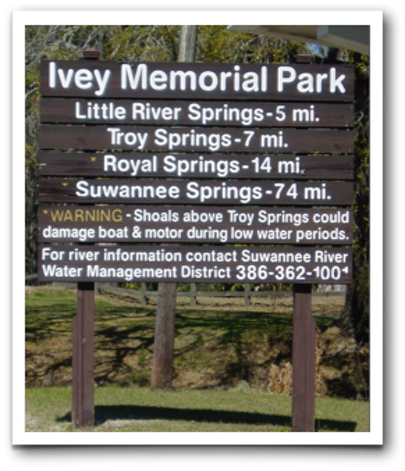 The river here is wider than at Suwannee Valley, probably twice as wide. The shoreline is more regular, with fewer twists and turns. 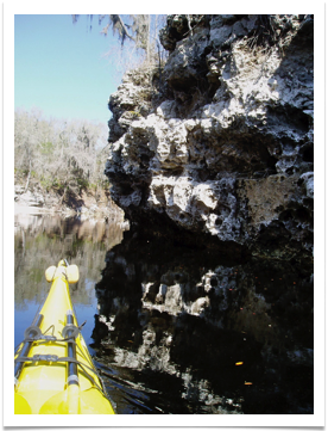 There are fewer limestone rock formations and almost no sandbars. We had the feeling that we were paddling into springtime. The trees and bushes that had been bare at the start of our trip, now exploded with buds, flowers, and the beginnings of leaves in that beautifully delicate new green of springtime. Rounding a long bend in the river, we came upon a “wake” of vultures. (OK, it was a flock of vultures. But it seems to me that if a flock of owls is called a parliament, then a flock of vultures ought to be called a wake.) There were dozens of them. They were marching along the shore. They were perched on driftwood. They watched from high in the trees on each side of the river. Their bald heads and crooked necks followed us, staring coldly with beady red eyes. They stood like sentinels, watchmen along the River Styx flowing slowly toward the Gates of Hell. I was glad to leave that part of the river behind us! Beside the vultures, we saw more Kingfishers and turtles, a pair of Cardinals, and Sturgeon breaking the surface of the river. Other unidentified fish jumped clear of the water, traveling several feet before dropping back with a loud plop. There were several hawks that we couldn’t identify and a gator. This guy was sunning himself several feet up on a steep sandbar, one of the few sandbars we would see that day. He was about six feet long and had a smooth deep gray hide. He looked very healthy. Scott and I noticed him at once, but John was closest. 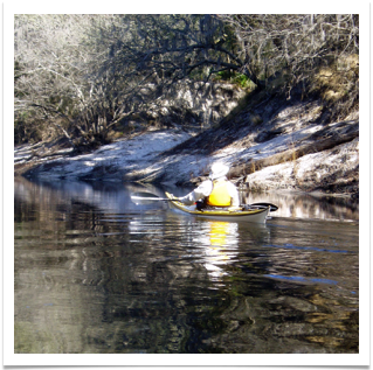 However, he was somewhere inside himself, lost in the hypnotic rhythm of his paddling and his own thoughts. He never saw it as it dove off the bank behind his boat and disappeared. Our destination today was Peacock Slough (pronounced “Sloo”) River Camp, the third and last of the river camps we would stay at on this trip. Along the way we passed Dowling Park, a.k.a. 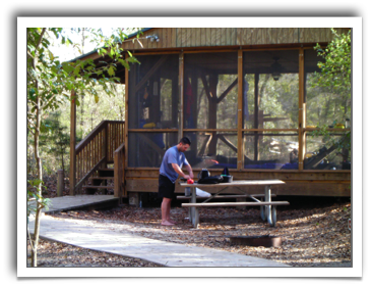 Advent Christian Village, which offers paddlers lodging (but not camping) and Lafayette Blue Springs State Park, that offers camping and more. 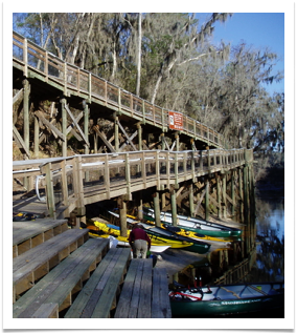 We had reservations at Lafayette Blue Springs, but like yesterday, we elected to by-pass this stop and press on to Peacock Slough to even out each day’s paddling mileage. We reached Peacock Slough River Camp late in the afternoon. We had covered 23.5 miles. At 75.5 miles total distance paddled, we were a little more than half of the distance to our end point, Fanning Springs State Park. The landing at Peacock Slough is excellent. There is a low, wide beach on both sides of the stairway leading into the camp. From the bottom of the stairs to the water’s edge is a matt embedded in the sand that makes dragging a boat from the water to the stairs an easy task that won’t damage the boat. To the north of the landing, the slough meets the river with a rush, creating the satisfying sound of moving water. The setting from the landing on the stairway above is beautiful. We all spent some time standing there, watching the afternoon sun shine through the trees behind us and throw sparkles on the water where the slough met the river. Peacock Slough appeared to be the newest of the camps we visited. (Click here for a video tour) The bathhouse was enormous and was air-conditioned. Outside was a lighted area with hot water for washing dishes – what a luxury! We went to find the camp host and soon spotted the usual RV parked at the back of the camp. As we approached there was a flurry of activity from inside the vehicle as a large black dog exploded out from under the RV, making it clear that we had better not take another step, Gee (pronounced with a hard “G” sound) called the dog and put him in the RV. Gee, the camp host, was a single woman from Quebec who was volunteering her time as camp host in exchange for being allowed to stay at the site for the winter. The dog was her protector. We nicknamed him “Killer”. It was clear that no one would get by Killer if Gee didn’t want him to. There was plenty of room in camp (we were the only campers again), we were welcome to stay, and the price was right – free! Scott asked Gee if she knew of any “informal” camping spots along the river, south of Branford. We needed a good unofficial river camp for tomorrow night. She did not, but offered to bring an outfitter friend to talk to us when he arrived later that day. We set up camp and were starting dinner when Gee and her friend showed up. The outfitter friend said the thought there was a sandbar beyond Branford, but wasn’t sure just where. Then Gee and her friend, and we hoped Killer, departed, not to be seen again, by us anyway. Dinner was Pad Thai. Excellent after a long paddle! After clean-up, we talked for awhile. Then each one of us went off to call home, as we had good cell phone reception here. The River Camp Gear Cart: Each River Camp has a sturdy gear cart that is usually found at the top of the stairs at every river camp landing. 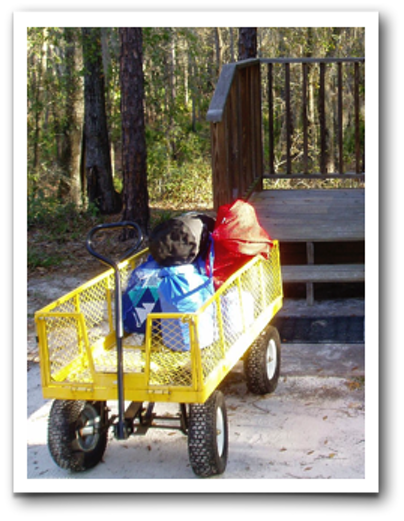 Since the camp is often quite a distance from the landing, these carts are a wonderful tool for hauling gear to and from the water. The night started off warm, but then cooled enough to make it comfortable in our sleeping bags. I read till ten o’clock, and then quickly went to sleep. I rolled over about one o’clock to see the light of the full moon streaming through our platform and didn’t awake again till about five, when the cold sent me looking for my watch cap again. At seven I was ready to get up, but it was still dark. So a lay there for awhile, finally crawling out at seven-thirty. We all packed quickly and had a fast breakfast of granola bars and bananas. The boats were loaded and we were on the water by 8:50 am. By 11:30 we had paddled twelve miles. We were scheduled to stay at Adams Tract River Camp, but were now planning to by-pass this camp as well, and camp along the river. We decided to stop and check out Adams Tract and tell the host that we would not be staying there. The landing at Adams Tract is the worst we had come upon. The bottom several stairs were under water and there was no beach. 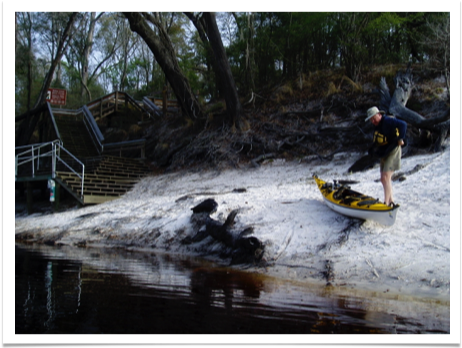 Scott managed to slide his boat along the steps into some brush and shallower water and get out there. There was no other space like that available, so I gingerly eased my boat parallel to the steps, braced against them with my paddle and made a somewhat less than graceful exit. There was no place to pull my boat out, so I tied it off using my bowline. John decided to avoid these problems by waiting in his boat. Adams Tract was similar to the other river camps, although the bathroom facilities were much less elegant. I’m not sure how the planners decide which camp gets what facilities. While basically the same, they are all different in specific details. We met the camp host and informed him that we wouldn’t be staying that night. This didn’t upset him as it freed him to go paddling in his new kayak. When asked about river camping beyond Branford, he said there was a large sandbar about three miles south of the town in the eastern shore. We thanked him, got back into our boats and paddled off. Soon Branford and Ivy Memorial Park came into view. It was still early, so we decided to take an extended lunch break here and see if we could re-supply some of our lunch fixings, as we were running low. From the river, Branford seemed like a scruffy little town. 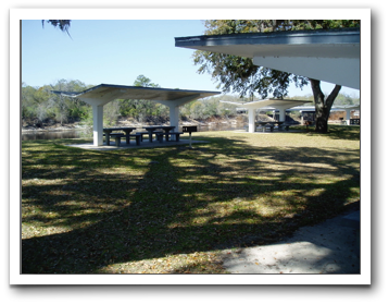 The park was pleasant, but kind of crudely made with picnic tables and shelters all made out of concrete. This seemed odd. Then we saw the pole that marked the heights of different floods that had hit the area. The highest mark at 37 feet was way above our heads. It would have covered everything in the park ad pushed way into town. It was sobering to think that this placid river could rise that much and potentially do so much damage. After lunch, we walked over to the local Kwik-Mart where we picked up peanut butter and bread for lunches. Then we each grabbed a cool drink and two ice cream bars! Did I mention it was hot? At the checkout were three of the largest folks I’d seen in a while. Two were young, one was middle-aged, and all were female. We later speculated that beauty in Branford must be judged by the pound! Around two o’clock we got back on the water after spending two hours in Branford. About three miles below Branford the river doubles back on itself in a 270-degree turn. On the backside of that turn is an enormous sandbar, twenty or more feet high, 300 feet deep, and perhaps 1000 feet long. It sat there, inviting us, shining beautifully in the afternoon sun. This would be our camp tonight. Landing was easy. We pulled our boats up and carried them close to a clump of bushes that we could tie off to. The three of us climbed the sandbar to the top, scouting the area for appropriate places to put tents and our kitchen. Soon each of us had staked out our spots. Scott claimed the low area to our west as the kitchen. It was sheltered under some trees, flat, and less sandy than some of the other areas. We started hauling gear from the boats. It was not an easy task. 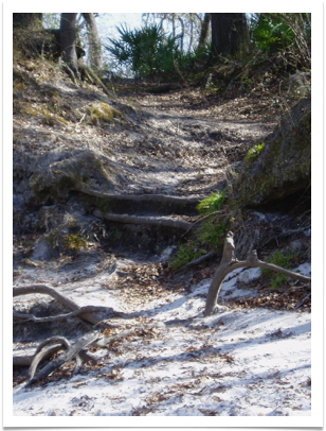 With each step forward up the hill you sank into the sand and slid back a half step. Soon our tents were set and made ready for the night. The kitchen was set up, waiting for the cook to appear. After swimming and drying off some, I put my Crazy Creek chair in the shade next to my tent and relaxed, watching the river. The tent sat at the top of the sandbar, back against some low trees and brush. I had an unobstructed view down river to where it finally turned a corner and flowed out of sight. It was peaceful and beautiful. Scott and John soon joined me. But sitting was bothering John’s back, so after a while, he went to his tent and stretched out. For a long time Scott and I sat watching the river, occasionally talking, but mostly drinking in the elemental beauty and peace of the place. For me it was the best part of the whole trip. That night’s meal was an experiment. None of us had ever used these ingredients together before. Five days into a trip it is nearly impossible to prepare anything with fresh meat or vegetables. Our meal would be freshly made, that is not a dehydrated meal in a bag, but without the perishables. Tonight we would have Rotini with Barilla marinara sauce and Bridgeford Party Bites sausages. The great thing was that the sauce came in a bag and so did the sausages – easy to pack and they needed no refrigeration! It was an easy, hearty and really good dinner! After dinner, John and I washed the dishes and cook pots. Then we all sat for a while longer, until dusk settled around us and the mosquitoes drove us into our tents once more. The night promised to be warm and pleasant. I left the vestibule doors tied back so that I could feel the slight breeze and see the river in the moonlight. After completing my journal entries and trying to read about cadavers and crucifixion experiments, I climbed into my sleeping bag and fell asleep. It was about ten o’clock. I awoke about one o’clock. It was still warm. The moon was lower, but still lit the sandbar and river with its pale light. Even with the moonlight, I could see many stars. I could hear fish jumping in the river below. Way off in the distance I heard another Barred Owl calling as I drifted back to sleep. At five O’clock I awoke again, wedged against the downhill side of my tent. As I pushed myself upright and to the center, I discovered that sand had been slipping out from under my tent on the downhill side every time I moved, all night long. My quick fix was to take any loose gear I could find and stuff it under the low side of my sleeping pad to level it till morning. It worked. I slept soundly till seven o’clock and was up almost immediately. It was a warm and pleasant morning. The river was calm and cool. Progress seemed a bit slower today than before. A check of the GPS showed that our push from the currant was less today than yesterday. This would continue as we drew closer to the Gulf of Mexico. The river was wider here, perhaps a thousand feet wide. The banks were lower and lined with trees and brush. There were no more limestone formations. And, there were many more camps and a few homes, though still many fewer than we would see on a similar river in the East. We passed a group of feral pigs rooting through the mud in a bank close by the river. Scott said there are lots of wild pigs in the south. They are escaped domestic stock that have become wild, like cats do if not living with humans. They can do a lot of damage. Most southern states hunt wild pigs to keep them under control. The river was flat calm and reflected everything around it like a mirror set on a table. John startled another gator by the shore that exploded into the water near his boat and disappeared. 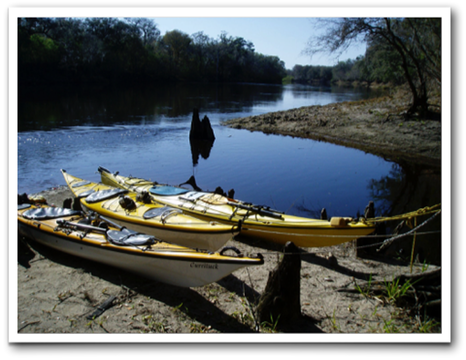 Hawks and turtles, cormorants and black vultures, heron and kingfishers marked our progress down the Suwannee that morning. 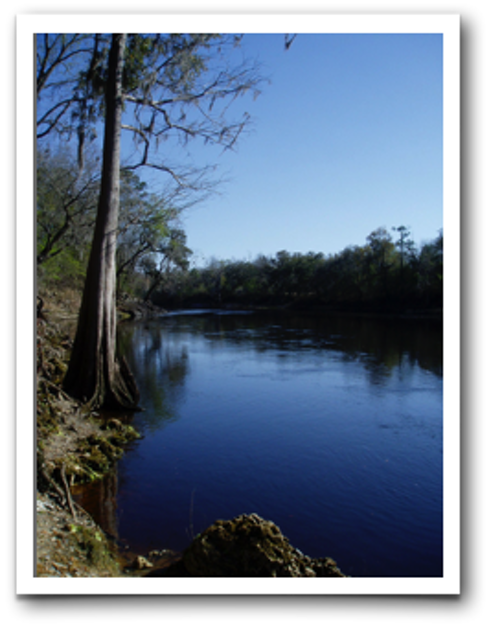 We passed the junction of the Suwannee and Santa Fe Rivers. The two rivers are distinctly different. 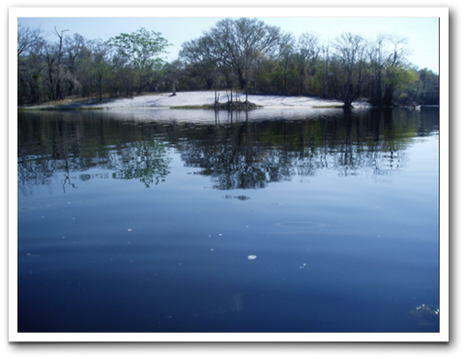 The Suwannee is dark, almost black, stained by the tannin in the trees it flow by and around on its long trip from the Okefenoke Swamp in Georgia. The Santa Fe is a much shorter spring fed river. It’s waters run crystal clear making it easy to see to the bottom in deep water. 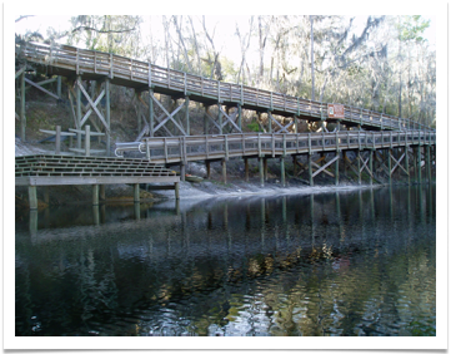 I was surprised to see some really large fish that had been concealed in the dark waters of the Suwannee. We had a hard time finding a place to pull out for lunch. There were no sandbars to be seen, not even a little flat bit of sand next to an open area where we could get out of the boats. And much more property here was posted against use by rabble such as us. Finally, Scott spotted a launching ramp, which appeared based on the signage to be public. It sat between two private cottages and was completely sun washed, except for a small spot of shade right in the center of the ramp. We didn’t have a lot of choice, so we pulled in and set up for lunch in the shady spot. We gave Scott a hard time about the fancy accommodation he had found for us. Lunch On The River: Usually one person carries lunch for all of us for the whole trip. It is contained in a medium sized dry bag. I carry a zippered container with a sharp folding knife, a lighter, hand sanitizer, a spoon and a small cutting board. 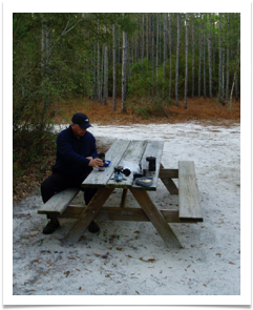 I often open my Crazy Creek chair and lay it flat as a platform for preparing our food out of the sand, dirt and debris of our lunch sites. Lunch is usually simple. No one likes to eat too much as it makes for uncomfortable paddling later. On this trip we carried block cheese, summer sausage, pita bread, crackers, fresh apples and trail mix. Two or three slices of cheese and sausage, wrapped up in half a pita, and followed by a third of an apple is plenty to fill us up and give us energy for the afternoon. (We split one apple between us. It made the apples last for days and seemed to be enough to satisfy.) This is not a meal I would eat at home – too much fat! But that is precisely what makes it a good paddling lunch. The fat makes you satisfied with a small amount of food, while providing energy. Alternatives include hard boiled eggs (they keep pretty well, but crush easily), tuna pouches (I like the spicy tuna), peanut butter (everyone likes peanut butter) and bullion cubes for soup on cold days. It didn’t take us too mush longer to reach the night’s camp - Gornto Springs. 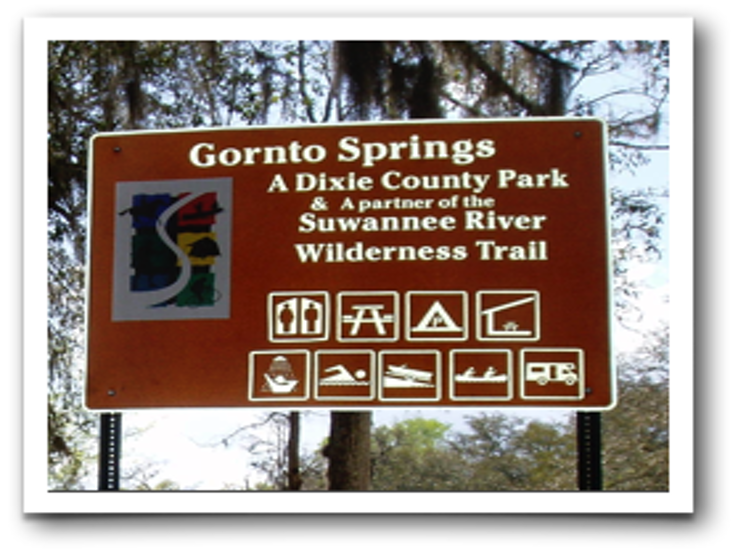 This is a Dixie County Park that is affiliated with the Wilderness Trail. It lacked the polish of the state sites. It appeared to be neglected. We pulled ashore next to a public boat ramp, where we tied our boats for the night. The camping area was in a marked open area under big trees. It provided plenty of shade. However, the end of the boat ramp aimed squarely at this area. It appeared that some boaters had driven through the camping area in an effort to pull their boats out and leave. The designated camping spot wasn’t that close to the ramp. However, tire tracks indicated that it might be prudent to place a tree trunk between the ramp and our tents. The park was busy. There were two women with two kids swimming over by the spring. Occasionally one of the women would light into one kid or the other. She had quite a mouth. The vocabulary those kids were learning would not help them out in school. Several times that afternoon a truck or old car would rattle into the park and pull up right next to the ramp, facing the river. The driver would just sit there, waiting for who knows what, sometimes with the vehicle idling loudly, sometimes sharing his exquisite taste in music with the park. It was never clear what they were there for, but they never stayed long before roaring off in a cloud of sand and dust. We had arrived fairly early, so after the tents were set up, we each went off to do our own thing. Scott headed for the riverbank to continue with Napoleon. Unfortunately, every car and truck that stopped in the park that day pulled up right behind his chosen spot. This included the two potty-mouthed women, who I think were trying to teach Scott some new cuss words only know locally. John and I were at the picnic table, he working on a “black belt Su Doku” puzzle, while I wrote in my journal. After a while, I wandered off to make a video of the park. (Click Here to see video of Gornto Springs) The park had potential, but was in a state of neglect and disrepair. The bathrooms, which were designed for day use, were crudely made and dirty. There was no toilet paper in the dispensers; not a problem for through paddlers who come equipped, but an issue for day use folks. There was no soap or paper towels either, and everything was dirty, making it unpleasant to use. The swimming area at the spring was in disrepair as well. The docks and swimming platforms were coming apart. A retaining wall on one side was crumbling. 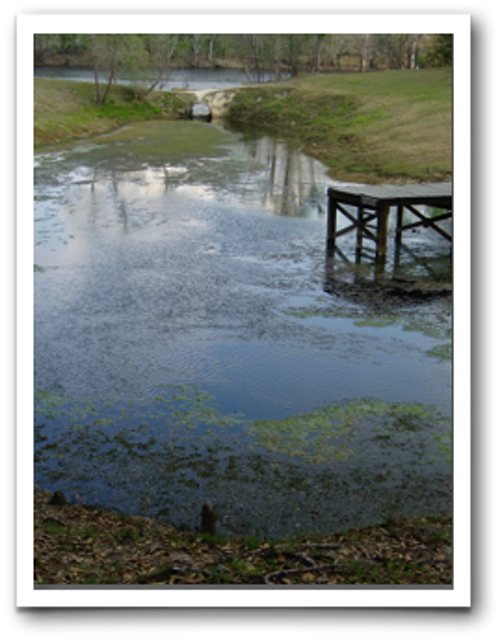 The grate at the spring’s outlet to the river was damaged, allowing for the possibility of at least small alligators entering the spring and swimming area. People had dropped trash and discarded clothing on the ground and docks. The spring itself was crystal clear but shallow. However, with the exception of a small open area on one side, the spring was choked with weeds. Still, it was a pretty place and adequate for our overnight purposes. It was hot in the afternoon sun, so I decided to get wet in the spring. I avoided the dock and crumbling steps and slid down to the water on a steep bank. I piled my shoes and shirt on a rock and waded into the knee-deep water. The temperature was pleasant, so I sat down and got wet, staying there till I felt sufficiently cooled before climbing out to air dry in the sun. Scott wandered over to see what I was doing, then we headed back to camp to begin dinner. While eating dinner, a late model Ford Mustang pulled into the park trailing a cloud of sandy dust. It drove right up to our table and sat there for what seemed like a long time. We looked at each other nervously, wondering what this was all about. Finally, a pencil thin man slowly climbed out of the driver’s seat, flicking ashes from his cigarette. He stood there for the longest time, taking drags on his smoke, until he finally said, apologetically, “I’m the park manager. I’m supposed to collect a fee for camping from you guys.” We said that we knew about and expected to pay the fee, and had in fact been looking for some official to take our payment. The park manager (I think his name was Frank) seemed really embarrassed to take our money, but finally, he did. Then he slowly walked back to his car and hunted till he found his receipt book and an ancient pencil. He slowly made out a receipt for the money we had given him, all the while taking long drags on his cigarette. After finally handing the receipt to Scott, he stood there blowing clouds of smoke and staring into space. Then he coughed several times, flicked an ash on the ground and said, “Now you fellows have a good evening,” and drove off in the same cloud of sandy dust that had brought him to us. Dark, accompanied by mosquitoes, came about 8 PM, when we all headed for our tents. After sorting gear and reading for a while, it was lights out for me at about 10 PM,. It was another warm night. I decided to sleep with one vestibule door pulled back. Somewhere nearby a pair of Barred Owls were carrying on a conversation as I drifted off to sleep. I’m awakened by loud voices. It’s 1:45 AM. Headlights swing around, aimed right at my tent. I remember the tire tracks that pass through our camp. I sit straight up, straining to hear what is being said. Are these some local boys up to no good? I quickly pull on some long pants and poke my head out of the tent door. The headlights are blinding me. What are they up to? Are they going to run us over or steal our boats? The headlights lift and shoot over my tent, into the trees above as the truck backs down the boat ramp. These guys are launching a boat at 1:45 AM? Why? The loud talking and the banging of gear on the aluminum boat continued for some time. Eventually the truck pulled its empty trailer up the ramp and went off to park somewhere. The loud talking continued until an outboard motor roared to life and it and the voices disappeared down the river. A little shaken, I crawled out of the tent to relieve myself behind a nearby tree. Quiet returned and so did sleep until 5 AM, when the roar and the voices returned. Once more there was banging and loud talk, headlights and the roar of the truck engine as it strained to pull the boat from the river. But eventually, the boat was loaded and these two old boys drove off into what would soon be dawn, seemingly oblivious to the fact that there were people attempting to sleep nearby. An hour and a half later I was up. It was still dark, so I stayed in my tent, packed up my gear and pouted. This last campsite of our trip was by far the least inviting. It was busy and really offered us no peace. 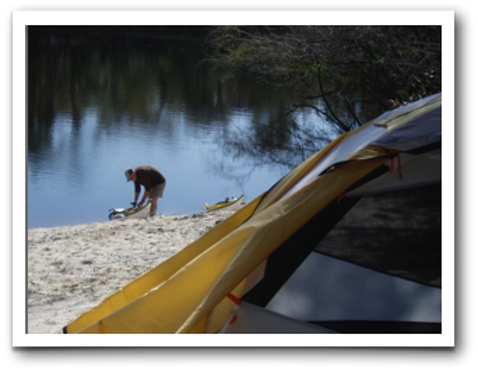 I was so grateful for the other sites, especially River Camp V on the sandbar. Another quick breakfast and we were on the river by 8:38 AM. I questioned Scott about what our nighttime visitors were up to. “Catfishing”, he said. “Night is the best time to go catfishing.” That was a real “duh” moment! So obvious, once you know about it. I think we were anticipating the end of the trip. Our minds were already looking ahead to what we would need to do upon reaching our destination. As we paddled, it was clear that we were reaching areas of greater settlement. For the first time there were many powerboats. Some of them were big and fast. All the powerboats seen to this point had been small fishing boats of low horsepower, because the river was relatively narrow and shallow. And there were few of them. Now we saw more powerboats and more settlements. We began to see much bigger houses and stone walls right down to the water, walls that had been filled behind so that folks could have lawns. These walls represented a fight that couldn’t be won. The river constantly tugged at those structures. There were as many breakwalls eroded and collapsing as there were sound ones. 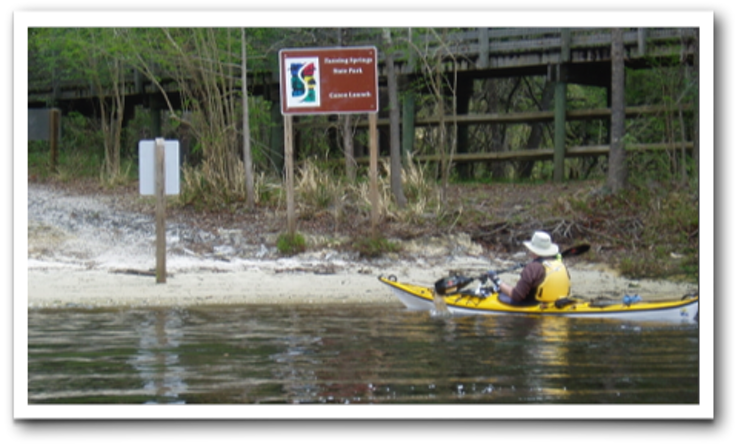 We grabbed a quick, fifteen-minute lunch at a private boat launch, then pressed on toward Fanning Springs State Park, arriving at 1:30. We had covered 21 miles in 4.5 hours. We spent a few minutes taking pictures and shaking hands to celebrate the end of our adventure, then Scott and I went to collect our cars. Yackman arriving at the canoe launch at Fanning Springs State State Park. This was the endpoint for our trip, 138 miles from our start at White Springs, and about 60 miles from the town of Suwannee at the Gulf of Mexico. The cars were as we had left them, but dirty from the spring pollen bloom happening all around us. Next came the inevitable unloading of the boats and the hauling of gear up the trail to the cars. Gear was laid out and sorted for the trip home. Scott had time to kill, so he laid out all his gear to dry before heading for Cedar Key and some clients waiting there. Finally, we carried the boats to the cars and loaded my car with my boat and John’s before we handed Scott’s boat up to him at the top of his fifteen passenger van. We said our goodbyes, vowing to do the upper Suwannee in Georgia next year. 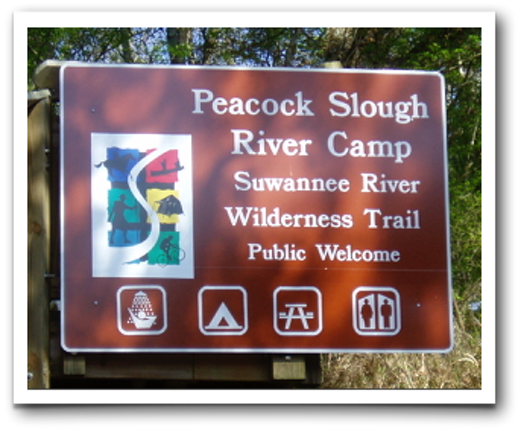 Then John and I climbed into the CR-V for the trip back to his car at the Suwannee Valley Campground in White Springs. John would collect his boat and gear and head back to relatives in Daytona. 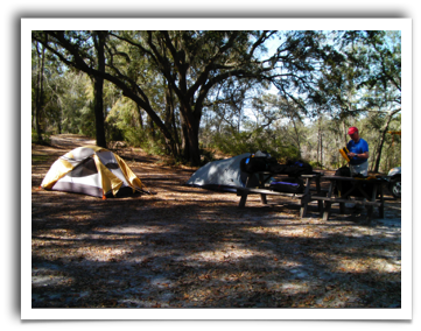 I thought I might stay the night at Suwannee Valley before heading north. But I wasn’t tired, so I showered, shaved and changed my clothes. At 6 PM I climbed into the CR-V once more, figuring I could drive for six hours or so before finding a place for the night.